Indigenous cultural tour operator Lirrwi Tourism has released its calendar of itineraries of the East Arnhem Land Yolngu homelands for the 2019 season. Single and multi-day tours offer visitors a range of ways to experience one of Australia’s most remote destinations and meet its Indigenous people. Developed and operated by Yolngu traditional owners, Lirrwi’s immersive tours offer visitors an incredible cultural adventure and the chance to experience the Yolngu way of life. Itineraries welcome visitors to Yolngu family communities and are designed to be flexible to work with the flow of the natural environment, the climate and the community. At the same time, the Aboriginal-owned initiative provides an economic base for Yolngu communities to remain on country and maintain their culture. Guided single-day tours operate July – October or by special arrangement, and include a Bawaka Yolngu tour, a Gululu tour and art tours as well as speciality tours like a Yidaki Masterclass with Djalu, birdwatching and cruise ship shore tours. Each day tour includes a Welcome to Yolngu Country, a guided experience of the landscape and an introduction to bush foods and traditional remedies, crafts and the stories of the land. A picnic lunch is provided as part of the tour and may be include seafood caught on the day. Multi-day itineraries on offer include a Crossing Country Tour, a Women’s Tour and a Photography Tour. Customisable tours are also available for corporate retreats and school groups. Multi-day tours are a rare and often life-changing chance for visitors to take time out from western routines and ‘go with the flow’ in Australia’s Indigenous heartland. 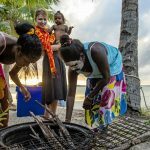 Unplanned events are always a possibility and make Lirrwi’s tours so special; perhaps weaving or creating traditional spears, the gathering of bush foods and medicine, or a stopover at the beach to catch a fish or mud crabs and the chance to take part in traditional Indigenous methods of cooking and eating them. A genuine adventure in culture, the five-day Crossing Country Tour visits remote Yolngu communities across East Arnhem Land with overnight stays at beautiful Bawaka Homeland. Lirrwi Tourism’s Women’s Tour is named Gay’Wu, meaning ‘dilly bag’ for its importance as a cultural symbol, both for its practicality in carrying bush foods and medicines, and for its spiritual significance: for carrying knowledge. On this five-day tour, participants connect with Yolngu women and learn about traditions and links to the earth. Rates for both the Crossing Country and Women’s Tours are $2399* per person twin share and include accommodation, meals, transfers and tours. A dedicated Photography Tour will run over seven nights May 12-18, 2019. 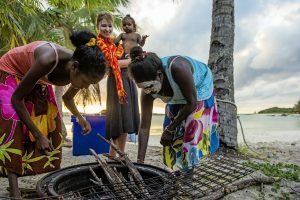 Limited to just nine participants, the tour includes a visit to the incredible Banubanu Wilderness Retreat on Bremer Island, three-night stays at two Yolngu homelands and a visit to the Buku Larrnggay Mulka Arts Centre at the Yirrkala community. Rates for this tour are $5,750* per person twin share and include accommodation, meals, transfers and experienced photography guide.